I do not know why, I download several versions for Windows, but I can install none. A black screen showed but disappear within a second. Sorry to hear that. I assume you are referring to 3DNA, since DSSR and SNAP are both self-contained, standalone programs. However, it is hard to guess why you cannot install the 3DNA tarballs for Windows. I've just tried the process, i.e., downloaded 3DNA 'MinGW/MSYS on Windows' and the Cygwin version, onto my Windows 7 VirtualBox. As seen in the screenshots, I did not experience installation issues. Note that you need to double-click 'msys' and 'Cygwin' icons to get the corresponding terminals for MinGW/MSYS and Cygwin. The MinGW/MSYS version may work in native Windows 'cmd' terminal, but I've not tried that myself. Specifically, simply double-click on the tarballs won't work in Windows. You are better off to use MinGW/MSYS or Cygwin for running 3DNA on Windows. Thank you very much for your reply! But I just downloaded both x3dna-v2.3-mingw-win and x3dna-dssr and try to install either one again, however, I falled for the same situation. It is likely that the first screenshot was about to appear when I installed, but it disappearred with a sound very quickily. Is that because that I am using a laptop or 360? Thanks for your follow-up. It is still unclear to me how do you mean by failing to install x3dna-v2.3 and DSSR. For simplicity, let's focus on x3dna-dssr.exe, the single Windows version. It should work right away on Windows from command line, even from the 'cmd' prompt (also from MinGW/MSYS and Cygwin terminal). Not need to install, just type 'x3dna-dssr' (or 'x3dna-dssr.exe'). See the DSSR User Manual or the blogpost "DSSR for Windows, one executable fits all". If you have any problem, please post a screenshot. When I install cygwin, which packages should I intall? I put the sreenshot in the attachment. May be I should also put this screenshot here. Besides, is there manual for 3DNA v2.3? Maybe I have install MinGW successfully, but I still can't install 3DNA. I put my case in the attachment. There is icon named MinGW shell. Sorry for my failure again. To be honest, I kept trying to install Cygwin, but instead of chosing the default, I follow the tips here,http://www.33lc.com/article/7276_2.html. I can't find gcc-mingw, so I chosed other packages including mingw. However, I kept failing. I put my case in the attachment, it is the same thing everytime. And this has been repeated for several times. Is that because of my network? I rely on the campus-network which is slow these days. I really hope I can make it and send a screenshot of successful installation to you. Sorry! I am really grateful for your advice and I will definitely review this experience. Anyway, I enjoy it. Thanks for your continuous effort. Persistence will pay off. Did you try install DSSR as suggested? It has a user manual and should be straightforward to get up and running. Let do one thing at a time. To be honest, I haven't intalled that successfully yet, I can only running it with cmd. I may have not found out the right place for running the command. I put it both in D\DNA, and C\bin. I showed my situation in the screenshots. If I didn't not open cmd and verify the path, it seem that things would not work. And I can run fiber -rna -seq=AAAAUUUGGGGCCCC fRNA.pdb successfully. I am really grateful for your replys, I tried to find others for help, they are very kind, but failed to help me out at last. To be honest, I haven't intalled that successfully yet, I can only running it with cmd. You've installed DSSR successfully already, since it is a command-line program. Your first two screenshots illustrate clearly that DSSR is working as expected, as documented in the User Manual and the blog post I referred to previously. DSSR and 3DNA v2.3 are two separate downloads, as you should already know. Is this point clear now? May be yes. I presumed it was because that the fiber is in 3DNA v2.3, I can't use that command with only DSSR, is that right? So how should I install 3DNA v2.3 now? DSSR is a new program that is completely standalone, as documented clearly in the User Manual. 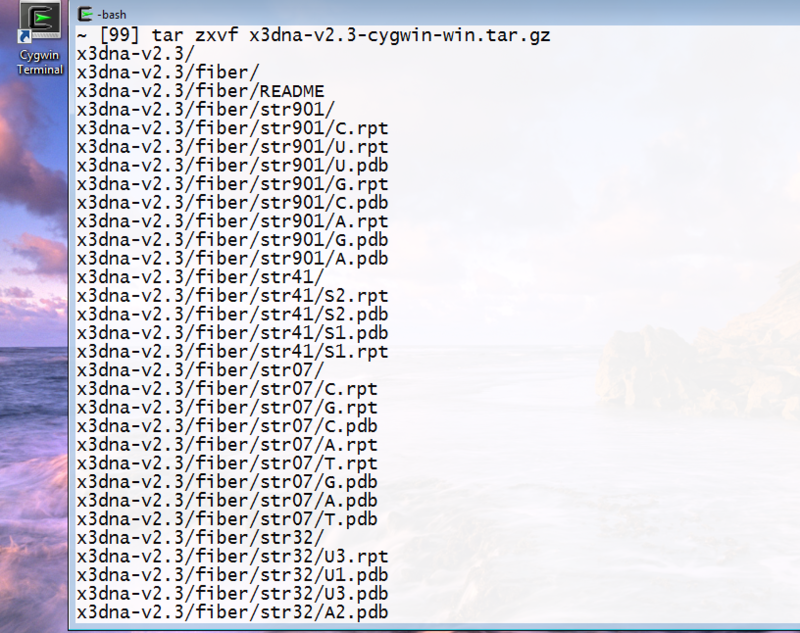 The 'fiber' program is part of the original 3DNA suite, which is now at v2.3. 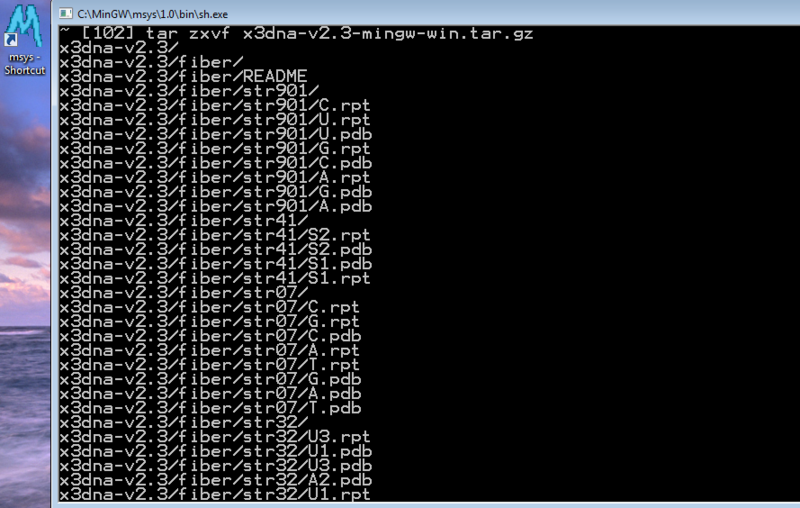 The installation of 3DNA is a bit more involved on Windows, since needs MinGW/MSYS or Cygwin. Please have MinGW/MSYS or Cygwin installed on your Windows properly, with help of local experts (see my screenshots on Feb 28). This step is entirely separate from 3DNA. I might have install MinGW, I got an icon of it. I put my case in the attachment. I failed to install Cgywin yesterday, it is the same case as the attachment above. I am still trying to install it now. But can I just use the default, rather than pick up packages myself? I also put the screenshot here. I finally install cygwin using default, but I can't run it. I show my case in attachment.